Моноплан-парасоль U 5, рассчитанный на трех-четырех человек, был оснащен двигателем мощностью 80 л. с. (60 кВт). Легкий транспортный самолет U 8, способный перевозить трех пассажиров, являлся дальнейшим развитием U 5 и оснащался более мощным 100-сильным (75 кВт) ПД Siemens-Halske Sh.12 или Bristol Lucifer. Он был построен малой серией; два таких самолета использовала авиакомпания "Deutsche Luft-Hansa". Вариант U 8b отличался крылом с механизацией. HITHERTO the Udet-Flugzeugbau of Munich have confined their attention to small machines mainly intended for school work or for sports flying. Now, however, they have definitely entered the ranks of the firms producing commercial aeroplanes, and their first machine, which was to have been shown at Gothenburg, has now been finished, and promises to be a very useful type. As the accompanying scale drawings indicate, the machine is of very "clean" design, in which external bracing has been entirely eliminated. As distinct from previous Udet machines, the new commercial three-seater is a "high-wing" monoplane. In fact it might justifiably be termed a "parasol" monoplane, as the wing does not rest directly on the top of the fuselage, but is separated from it by a small gap, and is carried on four vertical struts. This arrangement of the wing was chosen for various reasons. The designer of the machine, Herr Ing. Hans Henry Herrmann, believes that by having a gap between the wing and the top of the fuselage the slipstream effect on the former is reduced. Another reason is that it has been found difficult to provide, in a machine with a very small cabin, sufficient ventilation to prevent air sickness. Consequently, in the Udet three-seater the cabin is not entirely covered in, an opening being left in the roof, underneath the wing. It is claimed that with this arrangement the ventilation of the cabin is all that could be desired, while at the same time it has been found that there is no draught. Another advantage of the high-wing position is that it has been found possible to place the pilot's cockpit under the leading edge, so that it has not been necessary to cut out the latter. This is thought to have contributed to some extent towards the aerodynamic efficiency of the design, as generally speaking any openings or breaks in the centre-section wing curve have an adverse effect on the smoothness of the airflow. 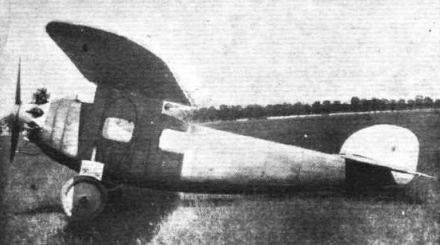 The fuselage of the Udet three-seater is of oval section, and is covered with ply-wood. The shape of the body should be very good aerodynamically, although nowadays it does not always follow that a shape that is good by itself is necessarily also the best when brought close to another body. However in the Udet probably the gap between the fuselage and the wing tends to reduce the mutual interference effect. The 70 h.p. Siemens radial air-cooled engine is mounted on a swivel mount, so that the back of the engine is readily accessible for inspection or adjustments. By undoing two bolts the whole engine unit swings out, much in the manner first used in this country - and we believe patented - by Boulton and Paul, Ltd. In the Udet this idea has, however, been carried a step farther, as all the engine instruments and controls are mounted on the engine unit and removed with it. A similar arrangement was found in the Morane-Saulnier cabin monoplane exhibited at the last Paris Aero Show. As the pilot's cockpit is immediately aft of the engine mounting, and the instrument board drops into its normal position when the engine plate is bolted up, there is no necessity to interfere with any throttle or ignition adjustments, and the only connection that has to be broken is the petrol pipe. It should be possible, by a suitable arrangement of the piping, to avoid even the disconnecting of this. The accommodation provides seating for two passengers in addition to the pilot. Entrance to the cabin and pilot's cockpit is gained through a door on the port side. The front seat in the cabin is placed slightly to the right of the centre line, so as to enable the pilot to get past it to his cockpit, and the second passenger to pass to his seat behind the front one. The seats are comfortably upholstered, and both passengers face forward. As the wing is above the cabin the view through the side windows is particularly unrestricted, and by standing up the passengers can look over the edge of the opening in the roof of the cabin. Aft of the cabin, and communicating with it by a door, is a fairly large luggage compartment. It would seem somewhat difficult to get bulky luggage through the cabin on its way to this compartment, and a door in the side would appear to be advisable, especially as the journeys to be undertaken by a machine of this type will scarcely be of such long duration as to necessitate the passengers being able to get at their luggage during the voyage. The monoplane wing of the Udet three-seater is of the pure cantilever type, and is of thick section, tapering both in chord and depth towards the rounded tips. It is constructed entirely in wood, the spars being of box section and ribs having three-ply webs and spruce flanges. The spars, it will be noticed, are parallel in plan view, so that at the centre section there is a considerable overhang both in front of and behind the spars, the distance between which is determined mainly by the chord of the tip section. As already stated, the wing tapers both in chord and thickness, the latter taper being approximately symmetrical in relation to the centre line of the spars, while the taper in plan is unsymmetrical, the leading edge being swept back 5° while the trailing edge is swept forward 7°. The leading edge is stiffened by a ply-wood capping extending to the front spar, the edges of this capping being of the "saw tooth" type, in which the points meet the centre line of the spar while the recesses lie on the wing ribs a short distance ahead of the spar. This form of nose stiffener was, we believe, first introduced by Fokker. The wing is secured to the fuselage by four struts inserted in the latter, and having corner plates to provide stiffness without bracing in a vertical fore and aft plane. Laterally these struts do not appear to have any bracing whatever, the rigidity of the struts being apparently relied upon to take the place of the usual transverse bracing of a centre-section. The struts, it should be noted, remain in place on the fuselage, and the wing is dismantled by undoing four bolts securing the wing spars to the top of the struts. The ailerons are of approximately triangular plan form, with the maximum chord at the inner end. The wing section used is not, as might have been thought, one of the Gottingen or "tadpole" sections, but has a perfectly flat bottom camber. The horizontal tail plane is of the trimming type, so as to allow of flying with or without passengers. While the main plane is set at no angle of incidence to the propeller shaft, the tail plane is normally set at an angle of +2,3°, and is thus at a greater apparent angle than the main plane. The downwash behind the high-lift centre section probably changes this into a slight negative actual angle. The undercarriage is of normal V-type in the first machine, but it is understood that a new type of chassis, offering less resistance and also slightly lighter, is being developed. As the illustrations will show, the Udet three-seater is of good streamline shape, and looks an efficient design. It is claimed that the gliding angle is approximately 1 in 14, and this does not seem to be an unduly optimistic estimate. The parasite resistance has been reduced to a minimum, and the aspect ratio of the wing is high (approximately 8). The main characteristics of the Udet three-seater are as follows: Length, o.a., 7-28 m. (23ft. 10 ins. ); span, 12 m. (39 ft. 5 ins. ); wing area, 18 sq. m. (194 sq. ft.); weight empty, 470 kgs. (1,033 lbs. ); useful load, 330 kgs. (726 lbs. ); total loaded weight, 800 kgs. (1,759 lbs. ); engine, 70 h.p. Siemens, radial air-cooled; wing loading, 9-06 lbs./sq. ft.; power loading. 25-08 lbs./h.p. ; maximum speed, 180 kms. (111-6 m.p.h.). As the fuel consumption is probably only about 6 gallons per hour, the Udet should do a matter of 20 miles per gallon of petrol, or a fuel cost per passenger carried of about 1/2d. per mile. Considering the restrictions under which the German designers are working, the Udet would appear to represent a really serious attempt to provide an economical aeroplane for use where the amount of traffic is small, or for use as a touring machine by the private owner-pilot. Although one of the younger German firms, the Udet works of Munich have shown quite surprising energy since the foundation of the firm a few years ago. In the Round-Germany flight a considerable number of machines are entered, most of which have been described in FLIGHT from time to time. At least one new type has been produced for the competition, and curiously enough this is a biplane, the U.12 - so far as we are aware, the first biplane to be produced by this firm. The Udet U.8, which has also been previously described in FLIGHT, is a commercial monoplane of very clean design. This also is shown in a photograph and by scale drawings. The ply-wood covered fuselage is of streamline form, and the cabin has seating accommodation for three passengers. The pilot's cockpit is in front of and above the cabin. The cantilever monoplane wing is mounted on two streamline panels growing out of the top of the fuselage. Normally the U.8 is fitted with 100 h.p. Siemens radial engine, but in the Round-Germany flight at least one of the machines will be fitted with 100 h.p. Bristol "Lucifer." The photograph of the U.8 published herewith shows the machine with the Siemens engine. The following figures of weight and performance relate to the machine as fitted with Siemens engine, but, presumably, do not differ very greatly from the Bristol-engined machine. Weight empty, 490 kg. (1,080 lbs. ); useful load, 370 kg. (815 lbs. ); total loaded weight, 860 kg. (1,895 lbs.). The top speed is 170 km./h. (106 m.p.h. ), and the cruising speed 140 km./h. (87 m.p.h.). The climb to a 1,000 m. occupies 13 1/2 minutes, and the ceiling is 3,000 m. (10,000 ft.). The Udet Three-Seater Commercial Monoplane: Three-quarter front view. The engine is a 70 h.p. Siemens, and the machine carries two passengers in addition to the pilot. The Udet U.8 is a commercial monoplane with Siemens engine.